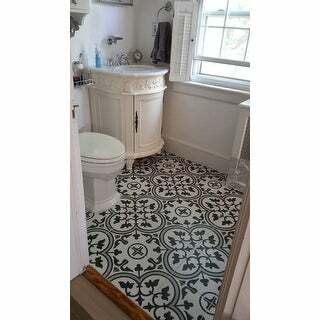 I’ve been looking for the perfect tile and loved this design. Can’t wait to get these installed in our brand new master bath! We are using them for a feature wall in the shower. 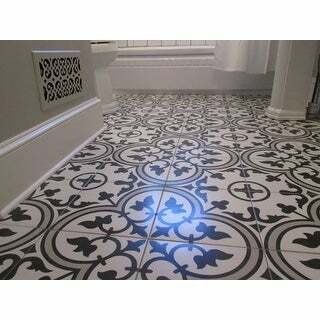 Elevate your bathroom to that of a five-star hotel with these gorgeous baroque floor tiles. Placed in the kitchen, you'll feel as though you're cooking for royalty. Please be aware that if you order more than 151 pounds of tile or flooring, the order may need to be shipped Freight and our Oversized Item Delivery/Return policy will apply. Please click here for more information. Dimensions 5.0 In. X 4.5 In. X 0.5 In. 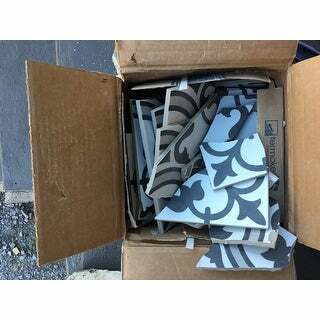 We ordered this beautiful smooth porcelain tile to use in our renovation of our 1950's bathroom in our home from the 1890's. We love the finished product and are very happy with the tile. The tiles are uniform in color so there wasn't an issue around trying to get the tiles to match. 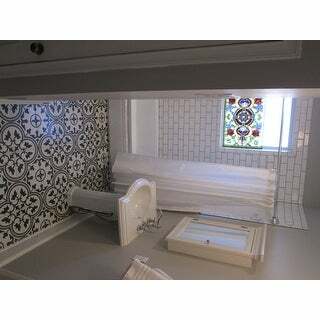 We would definitely recommend this tile to a friend and I really can't think of anything we don't like about the tile. 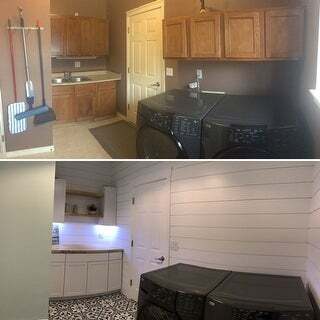 It looks great with the 1950's steel tub that we reused and refinished and provides a nice contrast to the simplicity of the subway tile on the walls. The ordering and shipping process was smooth and pretty quick. Since there was so much of it, the tile had to be shipped on a pallet through a company. They were polite and professional and put the pallet where I asked them to, outdoors in my carport. As to the durability and toughness of the tile, we ordered the tile in the summer so it would be ready to use when the project was at the flooring stage. However, our bathroom project ended up getting started very much behind schedule, so the boxes of tiles got exposed to rain, wind, and freezing conditions, including snow and frost. So, we unintentionally tested the claim of frost resistance. They passed with flying colors with no damaged tiles. We would definitely make the same decision on tile again without hesitation. 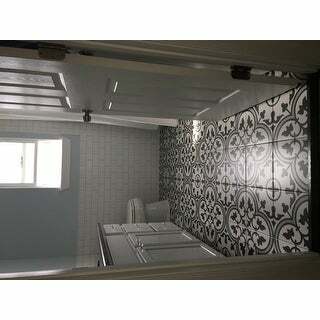 I fell in love with this tile pattern. I thought I found this tile at a good price on another website, but when I proceeded to checkout, the shipping cost more than the tile! 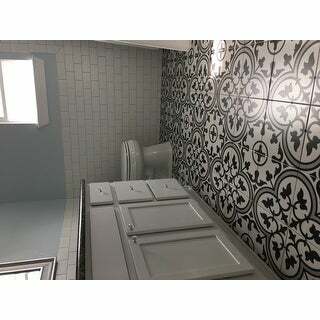 I was so disappointed and was about to settle four a tile I didn't like as much, but that I could afford for a bathroom remodel. Then along came Overstock! This tile was the lowest price AND free shipping. I did have one problem with shipping - the shipping company tried to send it to the wrong address - but the Overstock customer service got everything sorted out. (Their customer service was the best I've ever worked with!) Out of all the tile I ordered, only 9 were broken but I over ordered on purpose in case that happened. I love these tiles! I bought 4 boxes and NOT ONE tile was broken!! Theyre packed very well. Each box is pretty heavy. The tiles are a good quality thickness. I used silver shadow grout which looks good, it doesn't stand out like white would. I would highly recommend these to add a funky design element to your room. Simply the best at the best price. 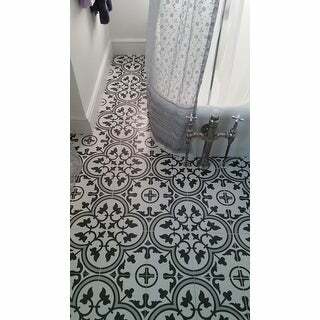 We just redid our bathroom and people always comment on the floor tiles! These tiles are very charming. They were delivered before the promised date and the tiles inside the boxes were all intact. I absolutely love these tiles. I used them as wall tile. My box came with one broken one. I contacted customer service and they had another shipped out right away. The rep was extremely helpful. 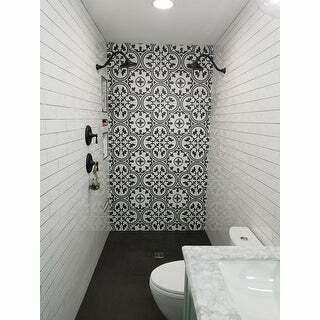 We're so pleased with this tile! It was well packed and none was broken. The size and color was consistent from tile to tile. 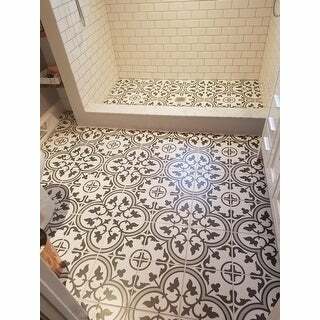 Love it for our bathroom floor. This tile is amazing! When we remodeled our kitchen I didn't want the same solid color floor tile that I've had for 30 years. At first I was hesitant to commit to such a "busy" pattern in my kitchen, but I'm so happy I did because it's the focal point of my whole house now and gets so many positive comments from my guests. Once my tile installer had laid out the pattern and got a few pieces down, he said it wasn't all that difficult to lay. This tile is super easy to clean and makes me smile every time I walk into my kitchen! I knew when I started my bathroom remodel that I wanted a feature wall that would stand out and be unique. We looked at multiple local tile stores and could not find what we were looking for. Once I saw this tile, it was love at first sight. And it did not disappoint. My feature wall, is AMAZING! 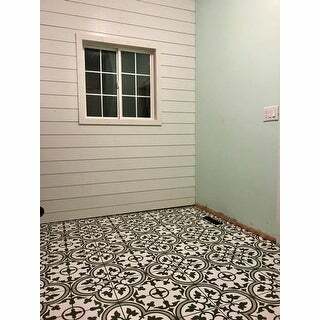 This tile is good quality. The pattern is vivid and beautiful. Each tile fits together nicely to complete the pattern. The lack of a star is because 3 of my 6 cases arrived with damage. I was able to salvage one complete case from the broken and shattered cases. The lack of a star is not due to the tile itself, but the freight carrier which appeared to drop something on half of my shipment. I also had to contact Overstock to locate my order. I highly recommend calling as opposed to emailing or chatting because the customer service representatives answering the phones at Overstock are very friendly and helpful. My order was found and scheduled for delivery by the freight company that day. Overstock shipped out another case of tile via UPS which is scheduled for delivery a week after my complaint and they refunded me for a case. I am pleased with Overstock's customer service! These tiles are beautiful. Large pattern that makes a statement. 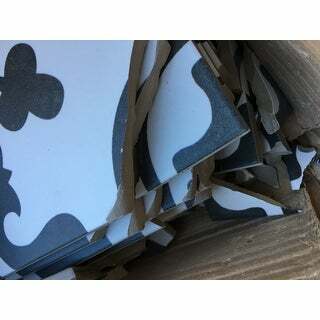 This was a large order and the tiles arrived freight. Many were loose and broken but Overstock credited me for all broken tiles. The ones that arrived intact worked out perfectly. I ordered 13 boxes for my floor and master bath remodel. The tile is easy to work with and in all of the 13 boxes received, not one tile was broken! Will post pictures when the remodel is done. Gorgeous! Love it more than the pictures! It shipped quickly and was packaged so well we had no broken tiles once it was delivered. It is a great quality tile! 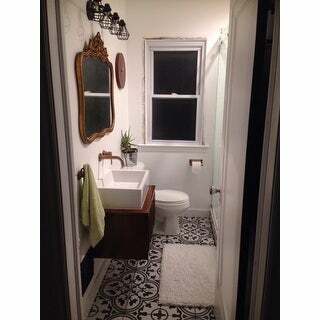 I am a designer and I absolutely love this tile. It came extremely well packaged and I do not think a single tile was broken. The quality is great, the colors are perfect for the look I wanted. This tile is GORGEOUS!!! I was planning on going with a solid-color tile because I like playing it safe, but took a chance on these tiles. So happy I decided to get these. They are going to look so good in our hall bath. This tile is beautiful! I was a bit concerned because the box states there can be color differences but this was a mute point. The tile is gorgeous...was easy to install and, embarrassingly, while hanging an art print, I dropped a hammer on the new floor and it did not break or chip! amazing! This tile is very pretty and is priced well. Because it is porcelain, it is likely to be durable and not very porous to water. I haven't installed it yet but the shipmen came in totally fine with no broken tiles. These have such a great old world style and they were easy to install. We love the look of our new laundry room floor. Install was simple. "Can you use these on a shower wall?" Yes, any of our glazed tiles can be used on a shower wall provided the background construction and shower pan are adequately waterproofed. "How do these tiles hold up when used on a bathroom floor?" "You don't have a square footage calculator like most sites. How much do I need to order for 110 sq ft. Or how many sq ft are in each case? Thanks"
Since each case of 16 tiles covers 10.76 square feet, you will need at least 11 cases to cover 110 square feet. We also always recommend purchasing at least 10% (closer to 20% for patterned tiles) more than you need in case of cuts and breaks. "How much does each tile weigh? How much does a box of 16 tiles weigh?" Each case of 16 tiles weighs 44.8 pounds. Since each case contains 16 tiles, one tile weighs 2.8 pounds. "What grout spacing/thickness works best with this tile?" We would recommend using a grout width of at least 0.25 inches. "May I purchase 3 whole tiles only?" This product is only available as a case of 16 tiles or as a 4 x 5 inch sample. "Is each 9.75 x 9.75 tile four pieces that are attached together with backing so you can grout between them? Or are the grout lines printed on the tile?" Each 9.75" x 9.75" full tile is sold by the piece and not on a backing on any kind since it is a field tile. There are no scored lines on this tile. The shower is one of the most used spaces in your home, and having the best shower tile plays a big role in your overall shower experience. Follow the steps below for help picking tile that will transform your shower into a spa-like retreat. Best Types of Tile for Kitchen Countertops from Overstock.com. Our guides provide customers with information about the best types of tile for kitchen countertops. 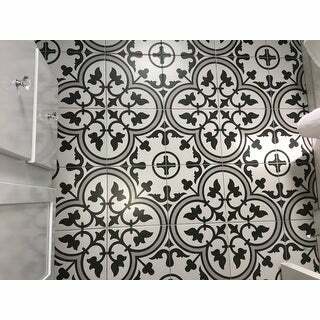 Tips on Removing Kitchen Tiles from Overstock.com. Our guides provide customers with information about tips on removing kitchen tiles. How to Install a Tile Backsplash in the Bathroom from Overstock.com. Our guides provide customers with information about how to install a tile backsplash in the bathroom. Porcelain Tiles vs. 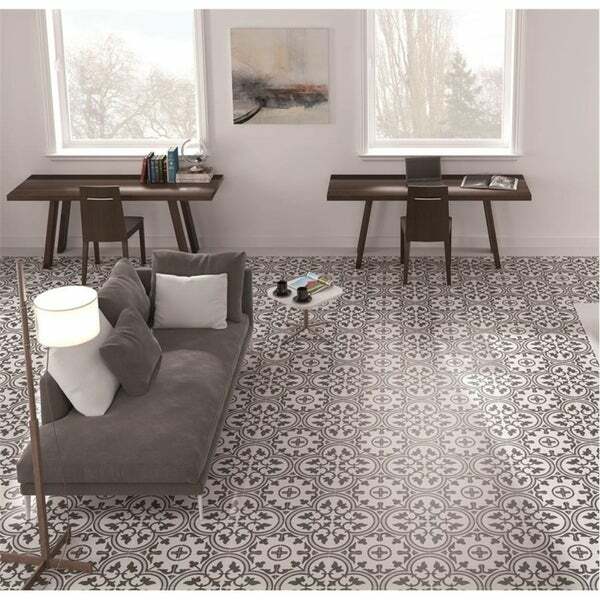 Ceramic Tiles from Overstock.com. Our guides provide customers with information about porcelain Tiles vs. ceramic tiles. 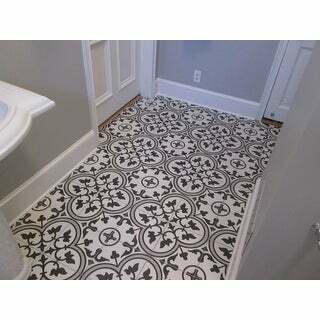 How to Choose Tile Colors from Overstock.com. Our guides provide customers with information about how to choose tile colors. 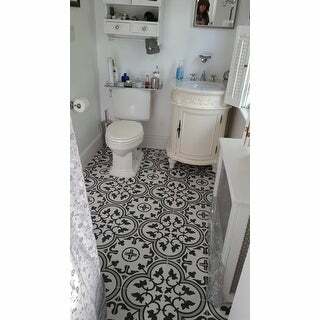 How to Install Tile Around a Toilet from Overstock.com. Our guides provide customers with information about how to install tile around a toilet.